This buffalo chicken recipe utilizes the original buffalo sauce used at The Anchorage Inn, the birthplace of the buffalo chicken wing. But, we take it to a new level. We grill chicken thighs and breasts while basting with the sauce. We make some homemade blue cheese dressing (don't turn your nose up at this - it tastes nothing like commercial blue cheese dressing) and toast some English muffins. We also grill some banana peppers, assemble everything and finish it off by wrapping it in bacon. The creation is hereby and forever more known as "The Buffalo Bacon Backer™". Please take the time to view the video below. 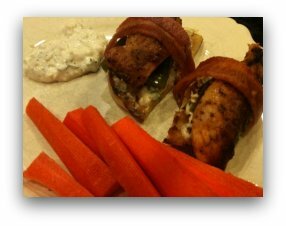 This was our first time making this delicious meal or sports game snack. Combine the three ingredients and bring to a boil over medium heat. Once butter is melted and mixed into the sauce, turn off heat. Please watch the video to see how this dish is assembled. Basically, you split four (4) English muffins and brush with olive oil. Toast them on the grill until crispy. In the kitchen, cook four to six pieces of bacon , but NOT all the way. They should still be pliable and flexible. Then, split three to four banana peppers and remove the seeds. Season boneless and skinless chicken thighs and breasts with salt and pepper. Take the chicken and peppers to the grill and cook until chicken is done and peppers are slightly browned. Be sure to baste the chicken with roughly 1/3 of the buffalo sauce. WARNING. SEPARATE THE SAUCE THAT YOU WILL BASTE WITH FROM THE SAUCE YOU WILL USE WHEN SERVING. Cut the chicken and peppers lengthwise. Cut the English muffins lengthwise as well. Cut the bacon lengthwise. Now it's time to assemble. On a piece of English muffin, spread some of Liz's Blue Cheese Dressing. Lay a piece of banana pepper on the dressing, then a piece of chicken. Wrap with a piece of bacon and spread buffalo sauce on the top. Broil at 450 degrees Fahrenheit for five minutes. Take them out and ENJOY! Click Here if you would like to ask me a question about this recipe. Trust me, we will get back to you within 24 hours, possibly sooner! For occasional updates and additional content, be sure to sign up for "The BBQ Gazette" by filling in your first name and email address below. And no worries. Your info is safe with me.